Background: Heterocyclic compounds have received much attention due to their versatile applications in the field of medicinal chemistry as well as organic chemistry. 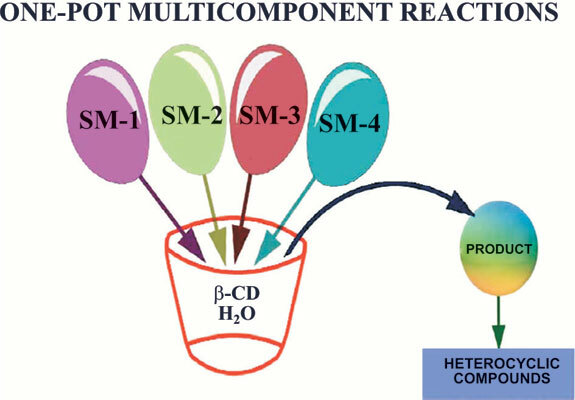 Objective: The main objective of this review is to give an overview of the recent application of β-cyclodextrin catalyzed one–pot multicomponent reactions for the synthesis of different assemblies of heterocycles. Method: In this review, we have summarized the one-pot multicomponent approach towards the synthesis of heterocyclic compounds by using β-cyclodextrin as a supramolecular catalyst. It is outlined under the headings (1) five-membered heterocyclic compounds and (2) six and seven membered heterocyclic compounds. Conclusion: This review outlined the recent key developments in the synthesis of different O-, N- and S- containing heterocyclic scaffolds, following MCRs published by using β-CD and its derivatives as a supramolecular catalyst for the synthesis of five, six and seven membered heterocycles. The versatility of cyclodextrins and modified cyclodextrins will encourage chemists to develop new heterocyclic molecules by using multicomponent reactions in the near future. β-cyclodextrin, green chemistry, heterocycles, imidazole, multicomponent reactions, one-pot, spiro-oxindole, supramolecular catalyst.